Nov - 14 | By: Oregon Film | one comment. On Thursday, Nov. 16, Oregon Film, Kickass Oregon History, the Baker Heritage Museum and the Hollywood Theatre screen PAINT YOUR WAGON (1969), one of the most spectacular movies in Oregon’s long, rich, and varied film history. As the story goes – Gov. McCall appointed Warren Merrill, Oregon Film’s first director, in 1968 specifically to ensure that the permitting and transportation process for the Paramount feature shooting in Baker County went as smoothly as possible. This means as we celebrate the 50th anniversary of the production of the film, we also celebrate 50 years of the Oregon Film Office. To help better contextualize this, Oregon Confluence sat down, by email, with Anne Richardson of Oregon Cartoon Institute/Oregon Movies, A to Z, to talk a bit about the place PAINT YOUR WAGON has in film history. Q: Tell us what you see, as a film historian, in PAINT YOUR WAGON. A: In 1969, Westerns were at a crossroads. BUTCH CASSIDY & THE SUNDANCE KID came out that year, as did THE WILD BUNCH. There were Westerns that year starring Robert Mitchum, Angie Dickinson, Rock Hudson, Richard Widmark, Burt Reynolds, Lena Horne, and Raquel Welch. Hollywood was not done with the Western! PAINT YOUR WAGON wasn’t the only Western shot in Oregon that year. TRUE GRIT, with John Wayne, was shot here, and MACKENNA’S GOLD with Gregory Peck & Omar Sharif, was partially shot here. Q: Is PAINT YOUR WAGON a Western? A: Homer Simpson doesn’t think so. Q: Since Hollywood clearly had the option NOT to make a singing Western, why did they? A: One word: OLIVER. The 1968 Best Picture Oscar went to a musical, in period costumes. And two words: FUNNY GIRL. There were eight nominations (win for Streisand) in 1968.for FUNNY GIRL, a musical in period costumes. 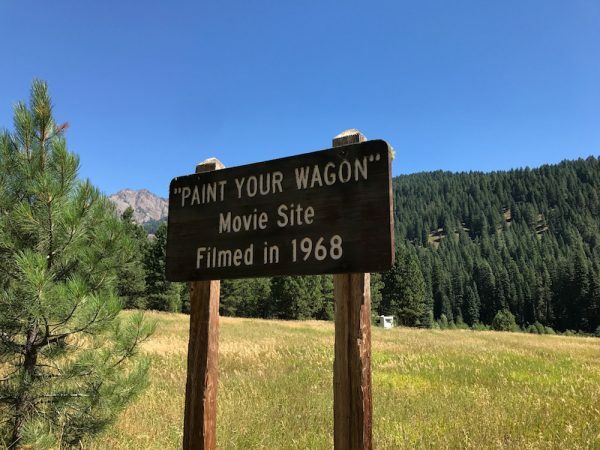 You can look at PAINT YOUR WAGON as a Western, but it might also belong on an entirely different list – as the first Broadway musical shot in a national forest. Q: Its hard to believe it was shot the same year as EASY RIDER. A: EASY RIDER creamed PAINT YOUR WAGON at the box office. Paramount spent 20 million making PAINT YOUR WAGON. Dennis Hopper and Peter Fonda spent under a half million making EASY RIDER. So in terms of Oregon film history, PAINT YOUR WAGON was a dead end. Paramount never again built a backstage in the Oregon woods. EASY RIDER, however, directly bequeathed FIVE EASY PIECES (scenes shot in Oregon) and DRIVE, HE SAID (entirely shot in Oregon). The profits from EASY RIDER went into those films. Those films, in turn, prepared Oregon for ONE FLEW OVER THE CUCKOO’S NEST, Michael Douglas’ and Saul Zaentz’ indie production. Q: I’m a fan of Kirk Douglas’s THE WAY WEST which was done in 1967 and also paved the way for CUCKOO’S NEST. A: I agree. When Kirk Douglas hired Andre DeToth to direct THE INDIAN FIGHTER in Oregon in 1955, he was definitely paving the way for his son to hire Milos Forman to direct CUCKOO’S NEST in Oregon twenty years later. So that’s an even more interesting way to look at PAINT YOUR WAGON, to see it within the timeline of the push/pull struggle for survival between the studio driven (hoped for) blockbuster and artist driven indie film. The independent producer model which prevails in Oregon film today can be traced back to the shift which occurred in 1969, the year PAINT YOUR WAGON hit the theaters, and everyone went to see EASY RIDER instead. Suddenly there was another way to do things. Q: So do you recommend seeing PAINT YOUR WAGON? A: Of course! With Clint Eastwood, Lee Marvin, Jean Seberg and Joshua Logan, all working on the same project, PAINT YOUR WAGON is pretty great. They don’t make musicals exploring ménage à trois anymore. Specially not ones set in the Wild West! Lots of reasons to go. Be sure to check out more from Anne Richardson here, and be sure to book your tickets to PAINT YOUR WAGON right now.